Old School Labs™ Ambassador Samir Bannout. Samir represents everything we admire about the art of bodybuilding. 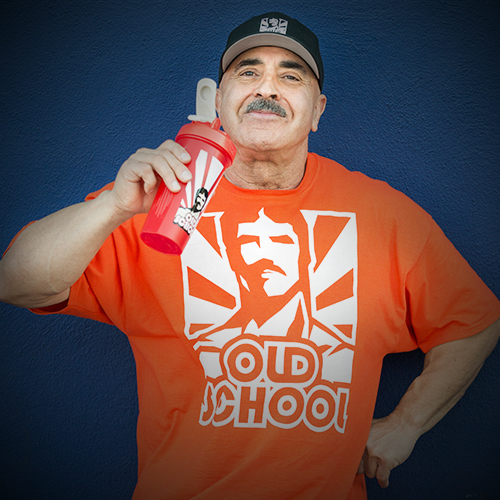 Old School Labs™, makers of the best-selling Vintage line of natural sports supplements, has signed Samir Bannout as a Brand Ambassador. Known as "the Lion of Lebanon,” Bannout, who won the prestigious Mr. Olympia title in 1983, is considered one of the greatest bodybuilders in the history of the sport. Born and raised in Beirut, Lebanon, Bannout began lifting weights at the age of 16 and earned his first trophy two years later in the 1974 Teenage Mr. Universe competition. For the next 22 years, he participated in more than 50 competitions and became a bodybuilding icon, renowned in particular for his incredibly developed lower back, which was immortalized as the “Lebanese Cedar.” In 2002, he was inducted into the IFBB Hall of Fame, joining such luminaries as Arnold Schwarzenegger, Sergio Oliva, and Larry Scott. As one of the pioneering bodybuilders in the “Golden Era” of the sport, Bannout, like his contemporaries, was committed to a balanced and healthy lifestyle. It was this orientation that led him to join Old School Labs as a Brand Ambassador. Old School Labs™ - Samir Bannout - Press ReleasePioneering Mr. Olympia Bodybuilder Samir Bannout Signed by Old School Labs™ as Brand Ambassador Old School Labs™ Press Kit H2 2017Read about us, our products, and values. Old School Labs™ Samir Bannout.Samir Bannout Performing an Iconic Lat Spread Pose. Old School Labs™Samir BannoutSamir Bannout Striking a Masterful Pose. Old School Labs™ Old School Labs™ Samir Bannout.The Lion of Lebanon Showcasing Incredible Posing. Old School Labs™ Samir Bannout.Golden Era Legend Samir Bannout at Venice Beach, California. Old School Labs™ Samir Bannout.Golden Era Legend Samir Bannout Post Workout in Los Angeles.